Game 12's exciting battle of attacks ended in a draw. This leaves the World Championship match in Elista tied at 6-6. Vladimir Kramnik and Veselin Topalov must now ready themselves for a series of fast tie-breakers to decide the world title on Friday. At the post-game press conferences both players appeared to be trying to put themselves in a psychologically stronger position. Kramnik claimed that Topalov "needed to make a number of forced moves to force a draw" while Topalov said exactly the same of Kramnik. Topalov's claim seems closer to the truth, since he could have taken a perpetual check at any time after reaching time control. Topalov, however, went as far as to say that he "felt he was winning at some point" but later admitted that was probably a false impression caused by him underestimating Kramnik's defensive resources. On Friday the tiebreaks will begin, the first time a World Championship has been decided by fast games.Friday's schedule will consist of four rapid games of 25 minutes plus 10 seconds per move, with a 10 minute break between each game. "It's going to be a lottery," said Kramnik, "where our previous score doesn't mean anything." Topalov agreed on both points – a natural reaction from someone whose score against Kramnik in rapid games is not impressive. He also lost a rapid playoff against Kramnik in FIDE's World Championship Knockout tournament in Las Vegas in 1999. If the score is tied after the four rapid games then the time limit gets accelerated to 5 minutes per player plus 10 seconds per move – not quite blitz but not slow either. If the two 5 minute games end at 1-1 then the world title will hang on a single Armageddon game. The players will toss for colour, White getting six minutes to Black's five (with no increment) but Black having the advantage of knowing that a draw will leave Black as World Champion. The Armageddon game will have a few special rules which are designed to avoid disputes, most particularly that an illegal move – normally a fatal error in a blitz game – will not lose automatically but will simply incur a time penalty. Up until now the players have copied the moves of games 9 and 11, but with colours reversed. Now, however, Kramnik shows that he can come up with some new ideas as well, although by the speed of Topalov's replies it soon became clear that Topalov had also examined 8.g3 deeply. It is too risky to grab the b pawn in view of 12.Qxb7 Rb8 and now White can only choose between 13.Qxc6 Rxb2! and 13.Qxa7 Qf6 14.f4 Nxg3!. 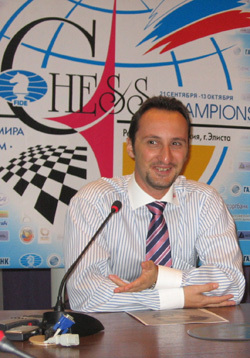 This seemed to take Topalov by surprise, as he began to think seriously for the first time in the game. Played at just the right moment, when 15...cxd5 will be strongly met by 16.Qc7. Strategically White has enjoyed some success, leaving Black with a weak c pawn, but Black retains counter-attacking possibilities on his kingside. Some might have decided to try to nip Black's kingside attack in the bud with 21.h4 but since this would be a strategic concession, making it almost impossible for White to later remove the Black knight with f3, Kramnik prefers to ignore Black's kingside build-up. Another big call by Topalov, who evidently decided that the …f4 break was never going to be feasible. 25.Rb2 Rh6 26.Qa6 Rc7 27.Rb8+ Kh7 28.Qa3 Rb7 29.Qf8!? This takes the theme of ignoring Black's kingside threats to an extreme. 29.Ra8, preparing 30.Qf8 looks more logical despite the concession of the b file. White's last move has left Black with the speculative possibility 33…Nf3+ 34.Ke2 f4!! ?, e.g. 35.gxf4 Nh4 followed by 36…g6+. However with the world title on the line, Topalov is not to be tempted by a line where a single miscalculation could spell doom. Instead he requires Kramnik to tread carefully, something Kramnik manages with ease, after which the game heads inevitably towards a draw. 43...Qb1+ 44.Ke2 Qxa2+ 45.Qc2 makes little difference – Black cannot afford to exchange queens and must keep checking.